Online options or a location near you to pay your GRU bill. Report any service interruptions you are experiencing. Start, stop or move residential electric or water service. Shout out to GRU’s apprentice lineworkers for dominating the FMEA 2019 Florida Lineman Competition Saturday, March 2. GRU apprentice Justin Dickerson was among the big winners, taking home first place overall. Check out all of our champions here. See a running tab of GRU’s savings since purchasing the biomass plant and buying out the power purchase agreement in November. It’s Gators vs. Bulldogs! 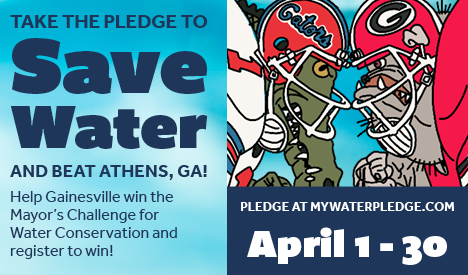 Help Gainesville beat Athens, GA, and win the Mayor’s Challenge for Water Conservation by pledging at mywaterpledge.com from April 1-30. Participants in the winning cities are eligible to receive prizes! GRU has earned the American Public Power Association’s Diamond-level RP¬3 designation for providing safe and reliable electric service. Diamond is the APPA’s highest level of recognition. Only 14 percent of the nation’s 2,000 public power providers received this designation in 2019.